Your kid got grounded. It happens all the time. Maybe they didn’t get their homework turned in on time, maybe they didn’t come straight home after school, or maybe they just tried to hide something they did on their device. Whatever happened, it’s time to ground your child. Don’t ask me how I know. Grounding your child doesn’t have to be very difficult. Your first instinct might be to take away their phone. While this is a VERY valid form of punishment, it also punishes the parents in a sense. Now you have no way to communicate with your child if you are away from home. You won’t know if Volleyball ended early for some reason, or if they missed the bus and need to be picked up. Instead of taking away the phone completely, there are other ways to “take away” the fun parts of the phone, while leaving it open to help you communicate with your child still. Within Boomerang, you can time-out the entire device. This disables the entire phone for the duration of the time-out. Unfortunately, you can only time it out for 24 hour periods at the moment. They can still communicate with you through the Boomerang Family Messages portal while the rest of their device is not functional. You can even do this from anywhere so they know you mean business! Another way you can ground your child is to just disable the apps they like to use. You can set the individual apps to be Blocked within Boomerang, but then keep other apps available that they need, like a school planner, their chores app and more. If you are tired of trying to remember to time out the device every 24 hours, or you don’t want to take the time to block all of the individual apps, and then go back and unblock them when they are done being grounded, you can skirt the system slightly by setting the only time the phone is allowed to be used to a 30 minute window that occurs in the middle of the night. This way, you only have to adjust the schedule back to the correct one after the punishment period has passed. Just don’t let your child know what time of night the phone is allowed to be used… they may just try to wake up in the middle of the night to respond to all of their social interactions! Of course, there is the kill switch you can use from your cell phone provider which is to turn off data service to the phone, or if you can disable internet to specific devices on your home’s wireless router. 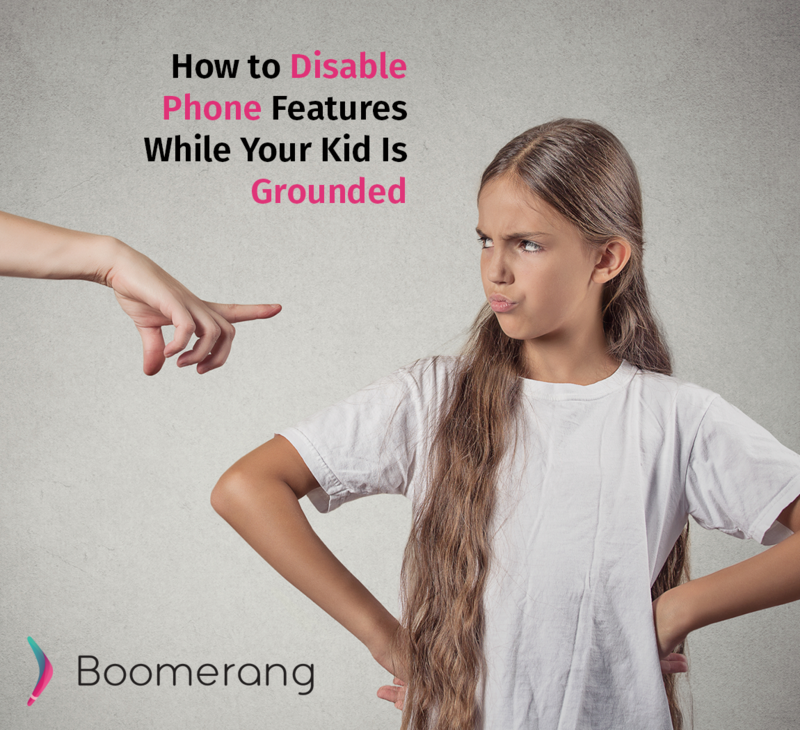 Your child still might be able to send text messages or call, but they would not be able to use the family messenger within Boomerang with data disabled. I would say this might be more of a pain than its worth. At that point, you may just opt to take away the device completely. Hopefully, your child will learn their lesson through this punishment phase, likely they will get punished again somewhere down the road. Just keep reminding them that it is your responsibility as a parent to teach them how to be adults, and you are only helping them to be successful in the future.